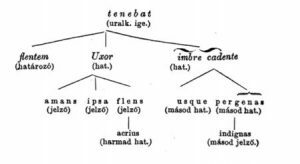 It is possible that Sámuel Brassai was the first grammarian to suggest verb-based diagrams. Here is an example of his system applied to a Latin sentence from 1873, quoted by Imrényi and Vladár. Uxor amans flentem flens acrius ipsa tenebat, imbre per indignas usque cadente genas. ’The wife, herself even more bitterly crying, was hugging the crying one, while a shower [of tears] was falling on her unbecoming cheeks [i.e. cheeks to which tears are unbecoming]’. Brassai, Sámuel 1873. Paraleipomena kai diorthoumena. A mit nem mondtak s a mit roszul mondtak a commentatorok Virg. Aeneise II. könyvére. [What the commentators did not say or wrongly said about Book II of Virgil’s Aeneid.] Budapest: MTA.